The Priest who Baptized 300,000 People. | The Size of a Mustard Seed. Matthew 17:20. The Priest who Baptized 300,000 People. There is something about the patron saint of the country you were born in. There is something about thinking that all the stories you have heard about them happened in the place you and your family came from. All of their work happened there, they lived there…. it’s pretty awesome to think about. 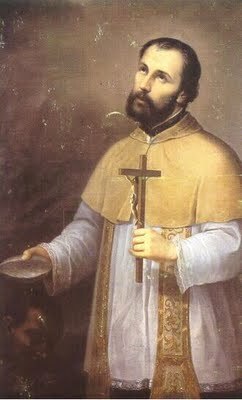 Well, since I was born in Colombia, I have heard the story of St. Peter Claver endless times. Although, it never fails at being an epic story. This saint was born in Spain in the year 1580, and went on to make vows as a Jesuit. As a young religious, he was inspired by St. Alphonsus Rodriguez to travel to the Indies to evangelize. This lead him to land in Cartagena, Colombia in 1610. There he met his ministry face to face. At that time, Cartagena was the principle slave market of the world. He knew he had to do something for the hundreds of slaves that arrived there.His mission was set before him: go care and spread the hope and message of Christ. Now, here it is worth mentioning what the weather is like in Cartagena. Let’s put this in very simple terms: It is VERY hot. Over a hundred degrees mostly. These are the conditions with St. Peter Claver choose to lovingly do his service in. And this ministry was extremely beautiful and heroic, but not at all easy. Once he was ordained in 1616, he took a vow to serve the slaves. From that moment on, he become dedicated to them. He also focused on abolishing slave trade and he bravely spoke about the slaves as Christians. The moment a slave ship would dock, he would quickly go into the horrible conditions of the ship. There, he was met with thousands of slaves all crammed in to space, all of them in desperate need of care and experiencing extremely high temperatures. This is where his work began. First by caring for the sick and dying and then by offering whatever refreshments he could. A huge part of his mission was to also catechize all of the slaves. He would lovingly teach them about the faith, and he baptized over 300,000 of them. The work this saint did is so inspiring. He did everything possible to share the message of Christ, even if it was in terrible conditions. He loved all whom he served and he taught that every human being had to be treated with dignity. Let us pray for the grace to be like this brave saint. To serve with a loving heart.. To be able to bring hope to all who we meet. To not be afraid to share our beautiful faith with the world. To love as Christ loved.